Give Up the Ghost by Megan Crewe. Henry Holt, September 2009. I love the totally creepy cover of this book! 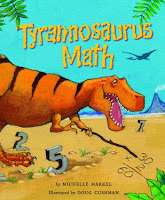 Tyrannosaurus Math by Michelle Markel. Tricycle Press, August 2009.
Who can add an entire herd of triceratops, multiply the legs of a group of ankylosaurs, and estimate the distanceto the next tasty meal? TYRANNOSAURUS MATH! I'm always looking for books for Nonfiction Monday, so I'm excited to peruse this one. Inside the Magic and The Wrong Side of Magic by Debbie Dadey and Marcia Thornton Jones. Tor Starscape, November 2009. These are the third and fourth books in the Keyholders series, which I've not read. But they're from the authors of the super popular Bailey School Kids series! Girl in the Arena by Lise Haines. Bloomsbury, October 2009. Lyn is a neo-gladiator's daughter through and through. Her mother has made a career out of marrying into the high-profile world of televised blood sport, and the rules of the Gladiator Sports Association are second nature to their family: Always lend ineffable confidence to the gladiator. Remind him constantly of his victories. And most importantly: Never leave the stadium when your father is dying. The rules help the family survive, but rules - and the GSA - can work against you. When a gifted young fighter kills Lyn's seventh father, he also captures Lyn's dowry bracelet, which means she must marry him. To win her freedom, Lyn will enter the arena to face her father's murderer in mortal combat. And she'll do it even though she may be falling for him. Whoa. This sounds intense. The copy on the ARC compares it to The Hunger Games, so you can be sure I'll be diving into this one and reporting back. So that's what I got in the mail this week... what did you get? I can't wait to read Give Up the Ghost - and wow - Girl in the Arena looks intense! I love the cover for "Give Up the Ghost." It is so eye-catching. Nothing in the mail for me this week, but these look good! great books this week! love Give Up the Ghost cover! hope you enjoy! happy reading! Just wanted to say Marcia Jones and I had great fun writing the Keyholder series. We tried for lots of action in books 3 and 4.